The phones at the National Tsunami Warning Center in Palmer sprang to life before forecasters even felt the massive earthquake that barreled out of the Gulf of Alaska just after 12:30 a.m. Tuesday. The magnitude 7.9 quake triggered evacuations along the Alaska coast from Sitka to Homer to Sand Point. It jostled people awake in the middle of the night. In at least 10 Alaska communities, the threat of a tsunami sent residents seeking higher ground as warning sirens wailed. "The phones started ringing before we even sat down," said Ken Macpherson, one of two tsunami center watchstanders on duty at the center on a side street in Palmer. The earthquake was felt from Unalaska to Fairbanks and all the way to Vancouver, British Columbia, and Washington state. Millions of people fell within the range of emergency alerts in the U.S. and Canada, from the Aleutians through British Columbia to California. The long, rolling shaker wasn't like some of the hard jolts Alaskans experience from time to time. That's because of this quake's depth and distance from cities, about 180 miles southeast of Kodiak and 12 miles deep. Forecasters at the tsunami warning center counted dozens of aftershocks as high as magnitude 5.2 in the hours after the big earthquake and say another as high as magnitude 6.5 or higher could still be expected. Still, there were no reports of damage or injuries in Alaska on Tuesday and the big waves never arrived.
.@AKearthquake ground motion visualization of the the Jan 23 magnitude 7.9 #earthquake off the coast of #Alaska. Just after 4 a.m., all Alaska warnings, alerts and advisories were canceled. The highest wave measured was just under 9 inches above tide level at Old Harbor on Kodiak Island. Smaller waves rolled into other coastal areas, including Kodiak and Seward. "Thankfully it wasn't as bad as it could have been," said Layton Lockett, the city manager at Adak out in the Aleutian chain. But for a few hours early Tuesday, people in coastal communities, including Adak, didn't know what to expect. They faced a tense and, for some, terrifying possibility that disaster was rolling out of the North Pacific. "It's a waiting game," said Kodiak Mayor Pat Branson. "But you just have to wait through it and see what the predictions are. Everyone here was very patient, everyone was very kind and calm." 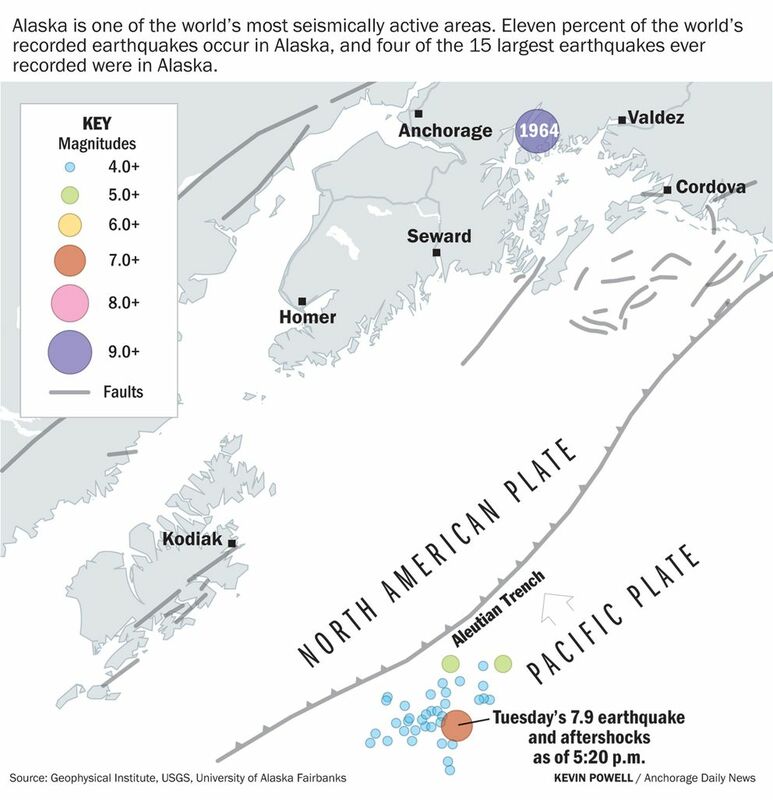 Forecasters predicted a wave would get to Kodiak first, arriving just 90 minutes after the earthquake shook the town. As tsunami warning sirens blasted through the community shortly after 12:30 a.m., residents streamed to higher ground in cars and pickups, packing the parking lots of schools and stores. Many drove up Pillar Mountain overlooking the city and harbor. "There were traffic jams and lines of people getting gas," said Branson, mayor of the community of roughly 6,200 people on Kodiak Island. The tsunami sirens woke up Jared Griffin, an associate professor at Kodiak College. He and his family live a block away from the water. They decided to evacuate to his in-laws' house, about 2 miles away and about 150 feet above sea level. There they waited. The younger children played, the teenagers went back to sleep and the adults sat glued to their cellphones watching the internet for any updates about a possible tsunami. "We really can't see anything," Griffin said around 2 a.m. "We've been trying to pull up some of the harbor cams but even there, they're really dark. You can't tell if the surf is receding or anything." At Kodiak High School, more than 600 people waited. Coffee was brewed. Teachers opened up classrooms so children could color. Some people curled up on the floor to sleep, and others talked at tables, said Larry LeDoux, Kodiak Island Borough School District superintendent. "You wouldn't believe how calm it was," he said. Eventually, as the warnings lifted, people meandered home. In Sand Point in the Aleutian Islands, gusty winds drowned out the tsunami sirens, said Police Chief Hal Henning. So he got in his patrol car and drove through the community of about 1,000 with his siren blaring, using the car's PA system to instruct people to get to higher ground immediately. "There were many people who were driving up with loads of people in the beds of their pickup trucks," he said. At least 250 gathered at Sand Point School, he said. "Everybody was calm and everybody was just kind of waiting it out," he said. "There wasn't any panic or anything. People were just making sure everyone was safe. It's a very close-knit community, and that really showed last night." In Seward, on the Kenai Peninsula, a fire truck traveled through the city streets early Tuesday with its siren on. Over its speaker system, someone repeated the tsunami warning and advised people to evacuate, said Brenda Ballou, city clerk of the City of Seward. People in the community opened up their home to others who lived in low-lying areas, she said. More than 100 people ended up at Seward High School, Principal Trevan Walker said. Many relied on a new public radio station for updates. Authorities in the city knew they were 10 minutes behind Kodiak if a tsunami was coming. "We were paying real close attention there," Walker said. "The opening of the window I think was 1:55. And so we're kind of watching 1:55 and it was silence and silence and silence." About 20 people ended up at the Pit Bar about a half mile outside city limits, said bartender Steve Krouse. "Everybody here right now is just part of the mad exodus from town," he said early Tuesday as the crowd still waited anxiously. "I didn't feel the earthquake happen, but then I started getting calls and I just start seeing the line of cars coming in." Sirens in town went off three times, Krouse added. "People are freaking scared, man," he said. When the magnitude 9.2 earthquake slammed into Alaska in 1964, it triggered landslides and deadly tsunamis, wiping out entire waterfronts of several communities, including Seward. On Tuesday, a big wave never came. "I think we all go really lucky; we're really fortunate," Ballou said. "It could have turned out differently." Natalia Ruppert, a seismologist with the Alaska Earthquake Center, rushed to the facility at the University of Alaska campus in Fairbanks on Tuesday, but a power outage had rendered the high-tech equipment useless. Heavy snow knocked down power lines and caused a significant outage before midnight. "We couldn't get access to our system for over half an hour," Ruppert said during a live Facebook question-and-answer session Tuesday afternoon, saying the outage delayed the center's response. "There was a little bit of time where I actually couldn't get any information." The center could install backup power systems and other redundancies, but that's expensive, she said. The outage was "a very bad coincidence," Ruppert said. "When we have a major earthquake, we want to be on top of it. We want to be able to respond right away." As nervous Alaskans tried to track any potential tsunami waves, other issues surfaced regarding the way information was being shared. Members of the public reported issues with slow tsunami and earthquake information websites. Officials at the tsunami warning center said the crush of users overwhelmed the system at times. Chatter on social media during the event also implied the government shutdown hampered emergency alerts and forecasting abilities. The shutdown did not change anything at the tsunami warning center, Macpherson said. Two watchstanders worked the overnight shift as usual, acting center director Don Moore said Tuesday. Another 10 people came to work as soon as they received alerts. Initially, the pair of watchstanders focused only on pinpointing any wave predictions and getting word out, they said. But as soon as more people filtered in, Moore said, the center put people in a meeting room to help field the hundreds of calls that came in. The type of seismic activity deep beneath the North Pacific mitigated Tuesday's disaster. The earthquake was a type known as "strike-slip" that occurred within the Pacific plate. That kind of quake isn't usually able to jostle enough water to generate major tsunamis. Instead, the ground shifts back and forth horizontally. Subduction zone quakes, in which one tectonic plate shoves below another, are linked to far more destructive waves because of the dramatic vertical motion involved that pushes up tremendous amounts of water. The magnitude 9.2 1964 Good Friday earthquake and tsunamis that killed 139 people and destroyed waterfronts from Alaska to California was a subduction zone quake. Still, for anyone who experienced that quake or raced for higher ground, Tuesday's earthquake and the wait for a wave was a somber experience. "People had to get up in the middle of the night.The sirens were really loud," Ruppert said. "Even though there were no serious injuries, no serious damage, it had a huge human impact." Anchorage Daily News reporter Nathaniel Herz and multimedia journalist Marc Lester contributed to this story.